Researchers in academia and life science industries continue to adopt a targeted, bottom-up MS-based workflow for protein biomarker evaluation. Biomarker verification/validation requires absolute quantification of surrogate peptides in the sample matrix, a requirement that is best achieved using well characterized standards. To ensure robust quantitative measurement, QC checks should be routinely performed. Eurisotop is pleased to offer a collection of PeptiQuant™ Assay Kits from MRM Proteomics, Inc. for QC and biomarker assessment using bottom-up LC-MS/MS methodologies. 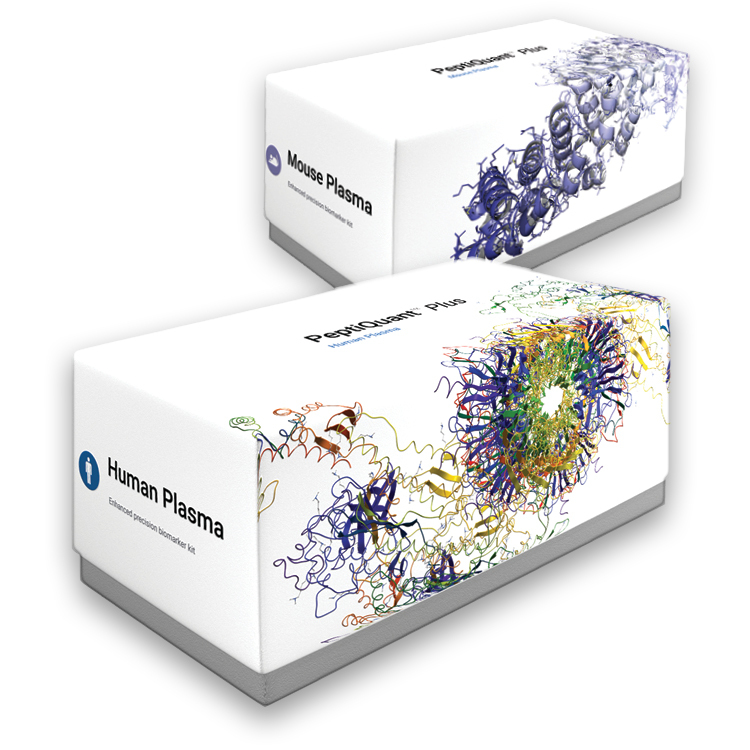 The QC kits are designed to evaluate the performance of a LC-MS platform, either alone or in combination with a human or mouse plasma proteomic workflow. The biomarker assessment kits (BAKs) are intended to help researchers screen target panels of candidate protein disease biomarkers in human or mouse plasma samples. Regarding the methodology, the original PeptiQuant™ kits utilize stable isotope-labeled standard (SIS) peptide mixtures, while the new PeptiQuant™ Plus kits employ mixtures of synthetic SIS and natural (NAT) peptides in the post-digestion spike of sample or surrogate matrices. Quantitation is achieved via reverse standard curves in the original kits and forward curves in the Plus kits (approaches described in PMID: 27341553). Comparatively, the new PeptiQuant Plus kits provide improved depth and precision of targeted protein quantitation. Further, these have been rigorously characterized according to the complete set of CPTAC (Clinical Proteomic Tumor Analysis Consortium) guidelines and are available for viewing on the CPTAC Assay Portal.